Tip 1. It’s time to get plumping – Because your sofa cushions are made of soft materials (and because they continually get squished by our backsides) they need to be reshaped regularly. You should take them off, give them a whack and a squeeze until the cover is filled out and the proper shape has returned. It’s up to you how often you do this as your eye will be the best guide, but we suggest you do it at least once a week. Tip 2. It looks flippin’ great – It will also help boost the longevity of your sofa to rotate/turn your cushions every now and then. This helps top stop signs of wear and tear emerging because of always sitting on the same bit of fabric. We think flipping the cushions at the same time as your plumping would make sense. Tip 3. Vac to the future – While you’ve got all the cushions off your sofa to plump and flip them, it is a good opportunity to give them and the rest of the sofa a quick once over with your vacuum cleaner. Dust and debris can build up regularly with lots of hiding places in your average sofa, so a regular hoover will help keep it clean, reduce scratching, pulls or pilling and cut the chance of bad odours taking root. Also, the dust can weaken the fibres in your sofa, so it is best to get rid whenever you can. We suggest you do this at least once a month, but more often if you are able to. Tip 4. Another fine mess – No one ever spills drink or food onto a sofa on purpose, but it sometimes happens. So what to do? Well, clean them immediately as stains are harder to remove once they set it. Wipe spills away, do not rub, with a dampened sponge. If you know what you’re doing, use an upholstery cleaning product specifically suited to your sofa to remove any determined stains. But if you’re not sure, seek advice from a professional. Using the wrong cleaner could make the problem a million times worse. Tip 5. It’ll all come out in the wash – Like a teenage son, you should force your sofa to have a proper, all-over clean at least once a year. But as with stain removal, only do it yourself if you know what you are doing or will be able to accept the consequences of getting it wrong. A leather sofa won’t necessarily like a cleaner/detergent aimed at fabric sofas and vice versa. The best option is to hire a professional cleaner to come and do the job. Obviously it won’t be as cheap as doing it yourself, but you’ll get a much higher standard of work. If possible, keep your furniture out of direct sunlight as over an extended period of time it can cause fading and weaken the fabric. Pet hair and the oils contained within them can cause stains and bad odours. The regular cleaning of your sofa will help reduce this, but having a blanket for your pet to sit on top of the sofa fabric is an easy solution. 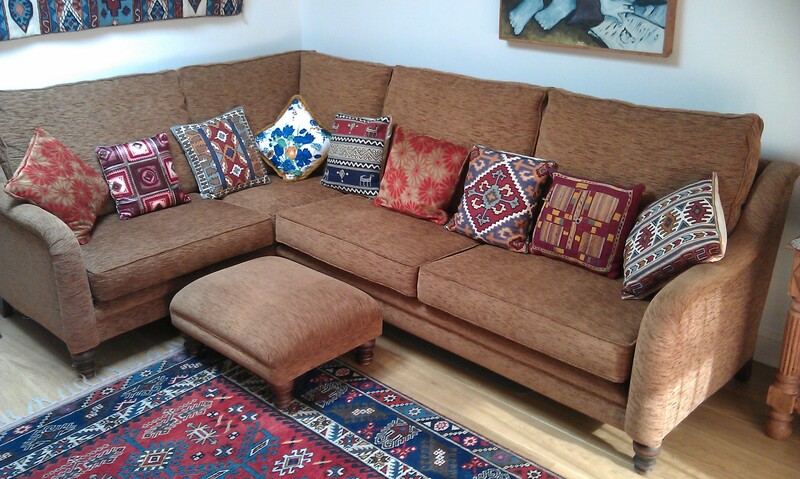 If you have any questions about sofa care or anything about helping your furniture stay at its best, then get in touch with us here at Hill Upholstery & Design.